1) Lofted Ball about 9 yd out. 2a) Quick Ball to OB (OF drifts into box), OB dribbles until nearly pressured, play ball into area. 2b) Quick Ball to OB (OF drifts into box), OB combines with OF, or plays to OF. 3) Direct ball to OF, OF dribbles at goal or plays ball into box. Player A delivers a cross/shot aiming for the goal/far post. Or looking to land the ball in the shaded area. Players run into and across the flight of the ball to glance header at goal. 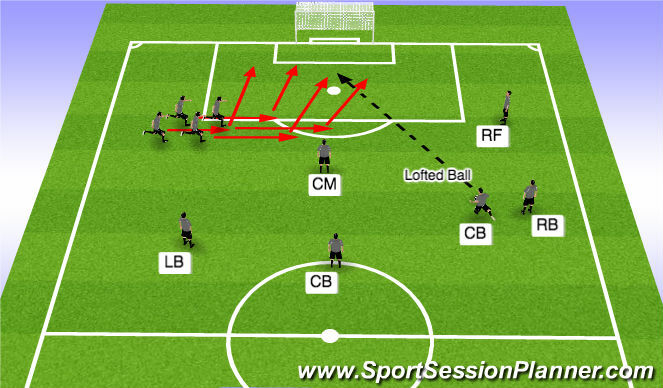 1) Player B can do a dummy run over the ball or A can pass to B, B stops ball and A Shoots. 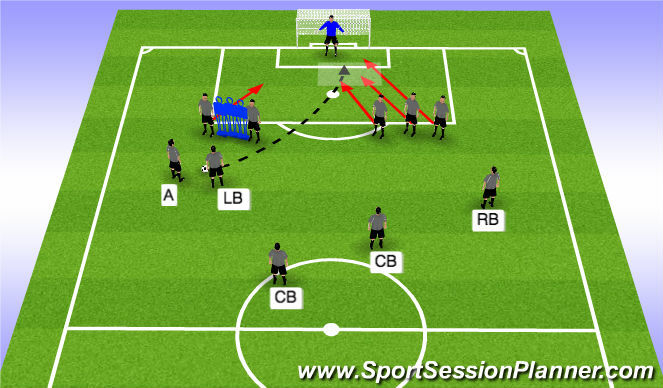 2) Player C makes a run across the line to receive a pass from A (D slowly peels off wall) who 1st times to D.